From the 1940s until the late 1980s, major movie studios had offices in Des Moines. Editor’s note: Des Moines Forgotten is a new column by Kristian Day that will focus on the significant works related to the people, places and events of Des Moines that no longer exist. Patty Crouse graduated from Creston High School in 1955. She knew she wanted to move to the big city of Des Moines, but like most teenagers right out of high school, she wasn’t sure what she wanted to do. She signed up with an employment agency where they landed her a job with Republic Pictures. When she asked what Republic Pictures did, she was told, “You know the movies ‘The Quiet Man’ or ‘The Fighting Kentuckian’? They made those.” It was a major film studio with offices in downtown Des Moines. And they were not the only one. On High Street, between 10th and 15th, where Mercy Hospital now is, was once an area called “Film Row.” From the 1940s until the late 1980s, major movie studios had offices in Des Moines. Warner Brothers, Columbia, 20th Century Fox, Paramount, United Artists, Republic Pictures, Eagle Lion, Monogram Pictures, and MGM all had offices in our city. Theater owners from Nebraska to the Quad Cities would come to Des Moines to make deals with the studios on the films they wanted to book. This was back in the day when films could play for several months up to even a year. Des Moines even had a large warehouse called the “Film Depot” where the movie prints were stored and shipped out. “Theater owners usually had to guarantee a four-week run when they booked pictures. Movies could cost $300 to $500 up front against 30 percent or 40 percent of their ticket sales,” Crouse remembers. Day-to-day operations included writing booking contracts, collecting down payments, and screening the prints to make sure they weren’t damaged before they went out. “We had our own 35mm projector and screening room. We would play each film to make sure it was clean and functioning properly,” she said. Bev Mahon and Bob Fridley were opening theaters together starting back in the 1940s. They were two young men with great ambitions and a love for the movies. 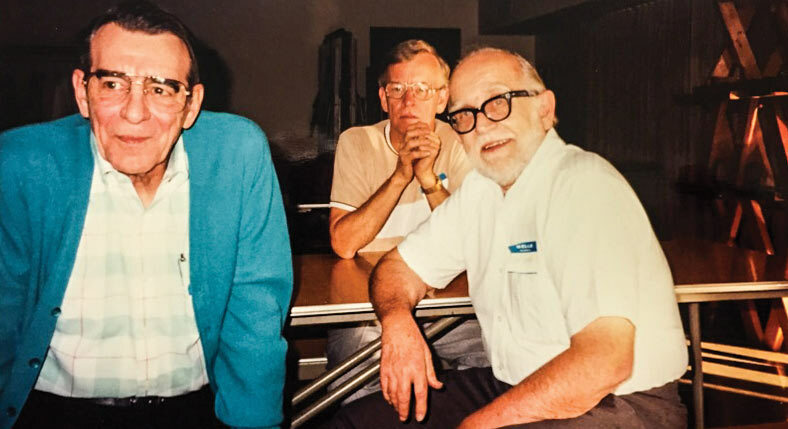 They frequented Film Row, and Patty Crouse remembers visiting with both men frequently. However, Uncle Sam called, and both were drafted during World War II. They found folks to run the movie houses, and then they went off to serve their country. 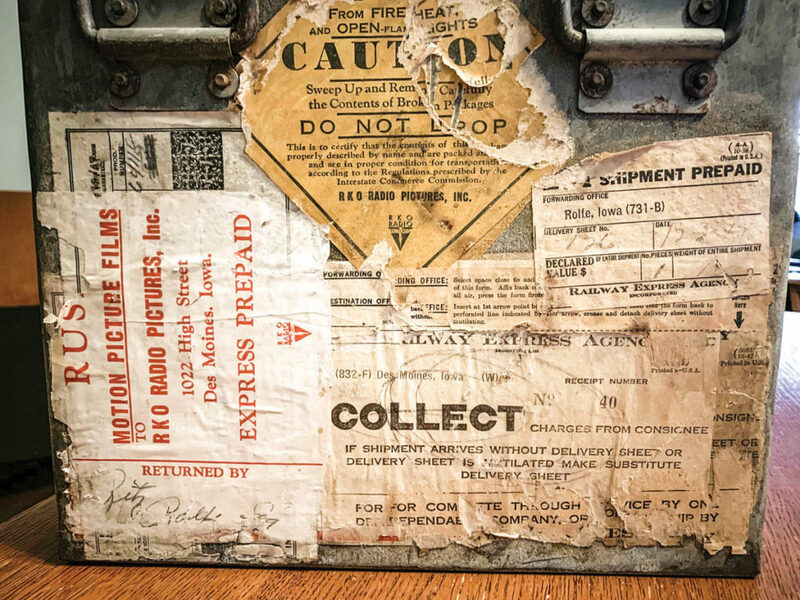 While Bev served as a cryptographer in the United States Air Force, he was still receiving his Box Office Magazine (official publication for the National Association of Theatre Owners, published since 1920) issues sent to him overseas. He could keep up with his industry trends and box office numbers while he was away. One day he was reading an article about the youngest office manager in the film business who was living and working for Monogram Pictures (1945’s “Dillinger” and 1947’s “Climbing the Matterhorn”) in Des Moines. Her name was Zora Fini, and after Bev came home from the war, he went down to Film Row to the offices of Monogram Pictures and asked her out on a date. The two were married on May 13, 1950. The studios on Film Row would come and go, but the people who were working didn’t seem to change. If someone worked for one studio, it was easy to move down the street to another studio’s office. When Republic Pictures closed, Patty Crouse moved to Columbia Pictures where she spent most of her time. Crouse cites the changes in technology as the cause for the studio closings. Small theaters also began to close when the multiplexes were opening up. The single and twin theaters couldn’t survive against the big movie houses that had up to 14 screens. Because the larger operations had so many screens to program, they were receiving huge deals on film prints. The end result was that there were fewer buyers booking films. Most everyone seemed to have deep connections with each other after 40 years of working for the studios. After Paramount closed, the folks who worked on Film Row continued to meet periodically for reunions. The Fridleys built their company of theaters, which is still active to this day (including the new Palms Theatre and iMax in Waukee). Bev Mahon’s Varsity Theatre became the longest operating movie house in Des Moines. Even after Bev passed away in 2009, his daughter Denise continued to run the show until she decided she was ready to spend more time with her family. She closed the Varsity at the end of December 2018. Kristian Day is a filmmaker, musician and writer based in Des Moines. Follow him on Twitter at @kristianmday. I believe it is UnityPoint / Methodist hospital that is on High Street between 10th and 15th, not Mercy hospital. Please correct me if I am wrong.